Hi Everyone! Hopefully the new year will give you lots of time for new quilting projects and related opportunities. Remember the Retreat the guild has scheduled for February. Since the Retreat is February 25-27, it was decided at our January meeting that we would not hold a Guild meeting on February 28th. Thank you to our hostesses Laura & Florence for their wonderful snacks! Jan Goppert opened the meeting reading from "Pieces" entitled Quilted With Love. Elaine - showed us her newest project, beaded Christmas ornaments. She has been busy helping her sisters clean out her mothers sewing closet and finding new projects to finish! She also brought her friend Barb. Welcome Barb! Beulah - was working on a Grandmothers Flower Garden using English paper piecing. Janis - said she left her BOM's at home! She brought in two charity baby quilts. They were Raggy Flannel Quilts in pastel colors. Carol - showed us her quilt that she made using blocks she received from a computer online swap group seven or eight years ago. She also brought in the squares that will become the relief sale quilt and stated that it is almost done and would like to put it in a frame at her house and begin quilting it on Mondays, Sew What Nights with help from all of us! More info later. She also continues to work on the Kitchen Challenge cookbook. Janis & Edith - They were proud to announce that the Shipshewana Blessings Wallhanging pattern that they designed, pieced and quilted is now available in booklet form. They had several on hand and were autographing the booklet for the ones that bought them. Fabric packets are also available at Yoder's in Shipshe. Edith - shared with us her round robin quilt top that she did along with seven other women via the internet (online). She also showed us her Hawaiian appliqué quilt that she made using her birthday fat quarters of hand dyed fabrics. Marie - showed us the navy blue/gray square-in-a-square quilt that she made for her husband. It was a replica of a quilt that her husband had many years ago. It was completely finished! Her husband helped with designing the quilt. Florence - was working on English paper piecing for a Grandmother's Flower Garden quilt. Laura - showed us the window valance that she made using the pattern Grandmother's Flower Garden. She was working on her green nine-patch quilt also. Naomi - brought in a block for Beulah and two finished Seven Sisters blocks. Congratulations on her marriage on February 12th to Tomas Miller!! Jan - donated a new Underground Railroad Book for the guild's library. Thanks Jan! Retreat News - Sue Stringfellow reported that quilters can arrive at the camp any time after 4:00 PM on Friday, February 25. A sign-up list was sent around for the chili supper we're planning Friday evening. Please bring whatever you would like and enough to share. Snackies are welcome also for the whole weekend!!! New Business -We discussed whether or not to have the annual April Tea with other local quilt guilds. It would be on April 25th. No definite plans as of yet. *Fern shared a website (www.quiltsforsoldiers.com) that was looking for volunteers to make lap quilts for wounded soldiers. The lap quilts need to be 50 x 60 in size. *Phyllis donated two items that were auctioned off. Marie bought a quilt calendar for $9.50 and Edith bought a rooster apron for $1. THANKS PHYLLIS!!! PROGRAM - presented by Edith and Marie. Marie and Edith asked everyone to bring their first quilts to the meeting and this is what everyone brought!! Naomi - Log Cabin quilt Wall Hanging made in the 70's. Elaine - a Sampler quilt made in a class in the 80's that isn't quilted yet! Barb- she received her first quilt from a neighbor lady 51 years ago. It was a Double Wedding Ring doll baby quilt. Sylva - had a Pinwheel quilt top from her grandmother that she knotted. Beulah - brought a mystery quilt made in 1995. Carol - she brought the second quilt she made(in 1973). In order to get the colors she wanted she used heavier material and wasn't able to quilt it. She appliquéd and knotted it for her baby son. Peggy - Trip Around the World quilt that was made in '77. Janis - cotton & polyester Dresden Plate made in '82. Edith - a cross-stitched three-panel quilt made in '68. Marie - Fan quilt Wall Hanging made in '92. Fern - Sampler quilt 2001. Sue - Nine Patch baby quilt pieced and knotted for nephew in early '70's. Jan - Star Wall Hanging made in '80's. Becky - Postage Stamp quilt (had 3938 pieces). She was 14 years old when she started it. Roberta - Cathedral Windows '90's. Phyllis - Double Wedding Ring, she began it in '36. Florence - Baby quilt that she knotted in '94. Laura - Log Cabin baby quilt for son in '97. She bought 20 yards of material to make this quilt! AQS Book Catalog - Elaine has order forms and you can order at the Retreat. Fundraisers: We will continue to offer the Fons & Porter Magazine subscriptions for $20.00, $10.00 goes to the magazine company and $10.00 will be given to our treasury. Also at each meeting anyone can bring in items to be auctioned off with the proceeds going to the treasury. · Seven Sisters quilt will be for 2005 Mennonite Relief Sale. Your blocks should have been turned in to Becky already. · Block of the Month (see following information). 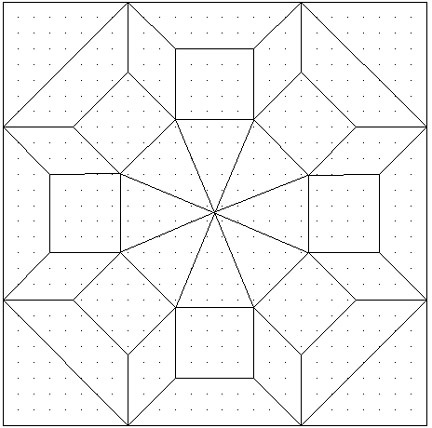 Block of the Month Project : Jan Goppert prepared the following information: Traditional Design - Pattern for 12 inch finished block. The members at the June meeting decided to have a Block-of-the-Month project this year. It was decided to have the patterns be traditional designs for a 12" finished block. 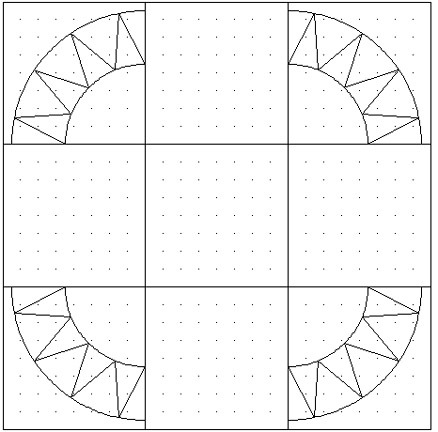 The blocks can be traditional designs with a "twist" if it is your own design creation. · Quilter's Hall of Fame; "Stitches Saved in Time;" January 31-February 25, 2005, 8-5. Monday-Friday; Reception - Friday, February 4, 2005, 6-8 PM. (If you are interested in attending this reception, Jan Goppert is looking for others to go with her). · Quilt opportunity $1 each to fund painting of the Marie Webster house. · Quilt contest, juried quilt show. · Indiana Heritage Quilt Show, Bloomington, IN, March 3-5, 2005. We will leave Chicago at 5:00 PM Indiana time, both days. Deadline for advanced tickets is March 15. I will take reservations for the bus up to the last day if seats are available. I will pass out show admission tickets on the bus. I must receive a check in order to hold a seat on the bus for you. On you check put which day you want to go and which pick up point you want to leave from. If you have any questions please call. *The Gathering is April 9th in LaPorte, IN. Pre-registration includes admission and a lunch (ham or turkey). Deadline for registration will be during the Retreat. If you plan to go to Chicago, you will need to do so on the 8th if planning to attend The Gathering. · National Quilting Day 2005, April 9, 2005. Mark your calendar for National Quilting Day 2005 with The Friends of The Quilters Hall of Fame in Marion, Indiana, featuring guest speaker Billie Lauder. The day will include a lecture from Billie, lunch, show and tell, door prizes and more! For complete details and registration form, send SASE to FQHF, 7897 S. 800 W., Swayzee, IN, 46986. · Dear Jane Retreat, Shipshewana, IN. April 27-May 1, For more information, contact Elaine Frey.